The Minimalist came at the request of one of our customers and is designed for those who prefer the gun to sit lower at the belt line with a minimum of material. This holster is very popular with LEO/private security personnel that sit in patrol/chase cars for long hours and/or don't need the muzzle covered. Every Minimalist comes shipped with our "Minimal" style belt loops. Ride height and/or cart can be adjusted by flipping one or both of the loops. 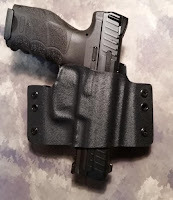 Also completely compatible with modular IWB soft loops (sold separately) for IWB carry. Attn Customers: Please Read click here to read Current Shipping Policies before placing your order. 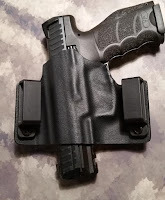 The Minimalist will NOT accommodate a weapon mounted light.